I absolutely LOVE the fan itself. I have a MAJOR complaint about the amount of light it puts out. We have about a 20 X 17 double story great room and it doesn't even put out enough light for a small bedroom. I can't believe they would make a fan this big and such a small light. You have to put this fan in a big room because its a huge fan. I am having to put can lights in the ceiling now because of how poor the light is. Just an FYI if you are expecting any light from this fan. 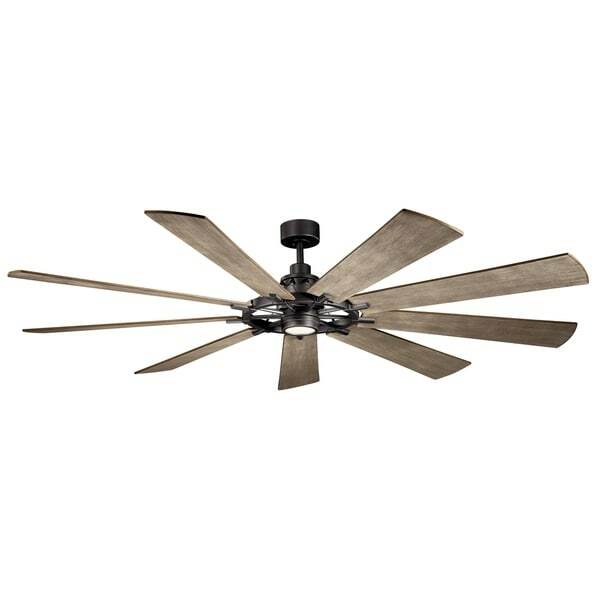 This Gentry XL collection 65-inch, 9 blade LED ceiling fan features your choice of an Anvil Iron, Distressed Black, or Weathered Zinc finish that will subtly highlight the existing décor in your home. These attractive fans will complement many lodge, country, or rustic decors. These LED Gentry ceiling fans know how to make an impact, both visually and with impressive airflow. The nine-blade design creates a stunning visual effect on or off. The industrial era-inspired Anvil Iron finish provides a style that fits with modern, classic or rustic settings. The LED light source delivers 1,600 lumens of output, about the equivalent of a 150-watt incandescent light bulb, for terrific ambient light. The DC165NL Motor will provide the quiet power you need. This fan comes complete with a 6-Speed DC Wall Control. Fixture Dimensions: 16.5 inches high x 85 inch diameter. At Kichler, we've been shedding light on what's important since 1938 by creating dependable, high-quality fixtures. Even as a global brand, we focus on building and strengthening relationships with not only customers and professionals, but with homeowners who choose our products for their homes. We offer more than 3,000 trend-right decorative lighting, landscape lighting and ceiling fan products in innumerable styles to enhance everything you do and show everyone you love in the best possible light. Dimensions 85.0 In. X 16.5 In.